Starring Virginia Gardner, Christina Masterson, and Eric Beecroft. 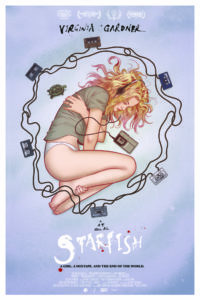 It doesn’t surprise me a smidge that Starfish filmmaker A.T. White doubles as a musician, an evident influence given the film’s pixie-melodic indie soundtrack. Not in an intrusive way, mind you. Critics often describe scattershot and hyperactive needle-drop-heavy sequences as “music video” unfocused. White may score the apocalypse like it’s an early 2000s quirky Michael Cera romance, or jump between visual realms (reality, cartoons, monochrome, etc. ), but artistry swirls around doomsday hopelessness with a *relative* Thirteen Reasons Why twist. Certainly for the more arthouse, narratively obscure appreciators – a markedly ambitious and ethereal debut for Mr. White. Virginia Gardner stars as Aubrey, a grief-stricken girl trying to cope (poorly) with her best friend’s death (Grace, played by Christina Masterson). She breaks into Grace’s apartment, basks in the memories, but then it happens – the end of the world. An already desolate mountain town empties even further, as extraterrestrial creatures roam outside. No explanation, no warning, just other curious radio voices trying to piece everything together. Then Aubrey finds one of multiple recorded tapes made by Grace, which leads to a scavenger hunt for the rest. Without getting too bogged down in the intricacies of White’s posthumous end times egg hunt, it’s suggested that a “signal” has opened universal gateways. Grace, and maybe others, deciphered said signal. On each tape is another piece of the fractured audio frequency that could save humanity – or doom it? All Aubrey knows is each cassette recreates a fragment of Grace while transporting Aubrey through time and space. Away from snarling, fangs-brandished monsters bursting through the gateways. Which appear as gigantic forcefield domes. It’s all there, for the reading, if you’re into aesthetic beauty over linear logic. Starfish is more emphatically about a late teen’s coping with tragedy, past mistakes, and moving on: accepting happiness inside to project it outwards. Often intimate, cleverly adorable thanks to pet turtle Bellini, and passionately emotional as Aubrey recalls relationships with Grace and – errr – others (keeping that silent). Gardner’s a powerful performer given she’s mainly alone – aliens are CGI, other survivors merely voices – wrestling with isolation, gripping finality, yet remaining faithful to the withered heart she still cherishes. Sci-fi elements add a curious genre touch, never super terrifying, but White’s core storytelling is pure when it comes to Aubrey. Human in a relatable way. What Aubrey encounters may throw audiences who’d enjoy richer mythology as gargantuan, glowing water-beetle-elephants stomp through town. Anywhere, Coloradoish is under siege by creatures banging barroom hideout doors, but Starfish elects to headline Aubrey’s paradoxical sleuthing. Backdrops flash from spikey icebergs to wheat-auburn valleys to a typical bedroom as she sits cross-legged, headphones drowning out her time-hopping. White’s arsenal of creative deployment features Anime-esque illustrations, 4th-wall breaking, eye-catching costume design (Aubrey’s “lone wolf” cover) – and it’s all so vivid. Beaming with cinematic vitality. 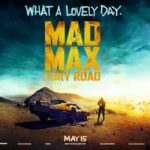 It won’t be what everyone’s looking for – “this movie is full of itself!” comments all over the IMDb page – so temper expectations. Elements do escape White’s attempt to structure a cover-to-cover tale of damaged nerves, such as backstory elements left in the dark. A faceless man who appears multiple times with a gaping wound. Relative mysteriousness around humanity’s collapse. Little details convey smaller notes – a Christmas tree that slowly browns and sheds to mark the passage of time – but it’s sometimes hard to decipher just *how* Grace and Aubrey fit into a social web that plagues Aubrey’s guilty conscious. Beautification aside, it’s a jumpy descent into Aubrey’s mind. Certainly the direction White planned to take – and more power to confidence – just a very *specific* off-kilter brand of coming-to-terms euphoria. A.T. White is infatuated with his project Starfish, and that’s not a negative. It’s a mixtape for avant-garde madness that keeps this cheery disposition even when dread literally comes knocking. At best, you’ll be enamored and enthralled by boundless on-screen shapeshifting from scene to scene. At worst, you’ll be utterly lost in a sea of tremendous ideas – but that’ll be made evident rather quickly. If you’re in the latter camp, feel free to switch off immediately. The rest? Bask in White’s bombastic communication breakdown. Matt spends his after-work hours posting nonsense on the internet instead of sleeping like a normal human. He seems like a pretty cool guy, but don’t feed him after midnight just to be safe (beers are allowed/encouraged). Follow him on Twitter/Instagram/Letterboxd (@DoNatoBomb).